The section of Southwest 8th Street between 107th Avenue and 117th Avenue will be closed starting at 9 p.m. Friday, March 9, until 5 a.m. Monday, March 12, 2018. The closure will allow crews to move and position a 174-foot section of the FIU-Sweetwater UniversityCity Bridge. The bridge, sidewalks and plazas will connect the City of Sweetwater with the campus. The pedestrian bridge was built adjacent to Southwest 8th Street on FIU’s campus. Westbound traffic will detour via southbound Southwest 107th Avenue, westbound Southwest 24th Street (Coral Way) and northbound Southwest 117th Avenue. Eastbound traffic will detour via southbound Southwest 117th Avenue, eastbound Southwest 24th Street (Coral Way) and northbound 107th Avenue. 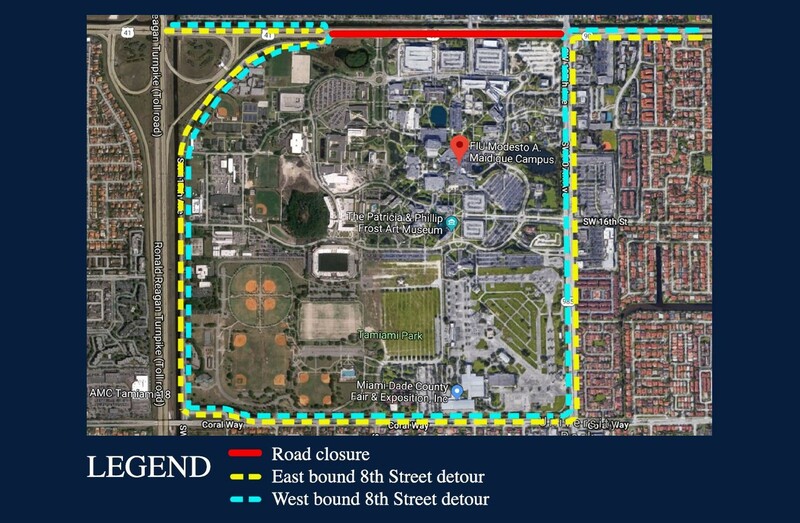 To enter campus, the FIU community can use the entrances on Southwest 117th Avenue and 17th Street or Southwest 107th Avenue and 16th Street. The detours will likely create periodic delays when entering or exiting campus.